Owen is just a normal kid living underground in the mines to escape the deadly sun in a dystopian future with a limited ozone layer when he is picked to attend the exclusive Camp Eden. Camp Eden is protected from the sun by a huge dome set up to mimic the outside world—with it’s own sun, moon, stars, clouds and ecosystem. On the surface things seem pretty good at Camp Eden, but when weak swimmer Owen survives ten minutes underwater without breathing things start to get weird. Owen’s neck is mysteriously gashed and the only thing that soothes the gashes is being underwater. Owen soon learns that he is part of a special race of people, the Atlanteans, called upon to rescue the world and fix a mistake made thousands of years ago. 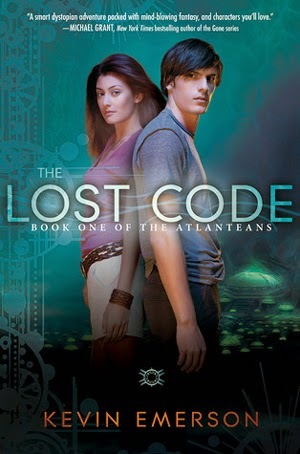 The first in a new series, The Lost Code will satisfy teens’ thirst for post-apocalyptic dystopian novels with just the right amount of suspense, adventure, science fiction, fantasy, and romance, but without the brutal violence found in other stories. Readers will eagerly devour Owen’s tale and look forward to its continuation.